The Office of Lauds is finished: the Canticles of joy are ended, wherewith the Church thanks the Eternal Father for his having made to rise upon us the divine Sun of Justice. It is time to offer up the second Sacrifice, or, as it is called, the Mass of the Aurora. 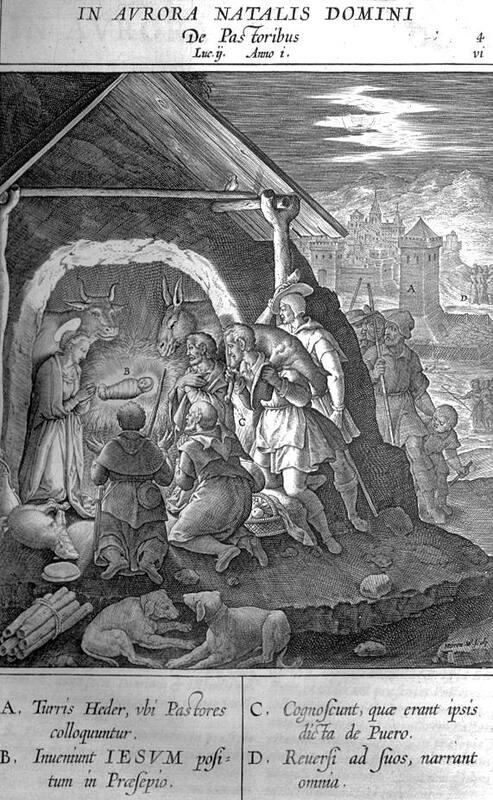 In the first, the Church celebrated the temporal Birth of the Word according to the flesh. In this, she is going to honor the second Birth of the same Son of God—a Birth full of grace and mercy;—that which is accomplished in the heart of the faithful Christian. See, then, how at this very hour, Shepherds are told by the Angels to go to Bethlehem, and how they hasten thither. With great eagerness they enter the Stable, which is scarcely large enough to hold them. Obedient to the warning received from heaven, they are come to see the Savior, who, they have been told, has been born unto them. They find all things just as the Angels had said. Who could tell the joy of their hearts and the simplicity of their faith? They are not surprised to find, in the midst of poverty even greater than their own, Him whose Birth has made the very Angels exult. They find no difficulty in acknowledging the wonderful mystery; they adore, they love, the Babe that lies there before them. They are at once Christians, and the Christian Church begins in them; the mystery of a God humbled for man finds faith in these humble souls. Herod will plot the death of this Babe; the Synagogue will rage; the Scribes and Doctors will league together against the Lord and his Christ; they will put this Savior of Israel to death: but the faith of the Shepherds will not be shaken, and will find imitators in the wise and powerful ones of this world, who will come at last and bow down their reason to the Crib and the Cross. What is it that has come over these poor Shepherds? Christ has been born in their hearts; he dwells in them by faith and love. They are our Fathers in the Church. They are our Models. Let us imitate them and invite the Divine Infant to come into our souls, which we will so prepare for him, as that he may find nothing to prevent his entering. It is for our sakes also that the Angels speak; it is to us also that they tell the glad tidings; for the Mystery that has this Night been accomplished is too grand to have the pastoral slopes of Bethlehem for its limits. —In order to honor the silent coming of the Savior into the souls of men, the Priest is preparing to go to the altar, and a second time offer the spotless Lamb to the Father who hath sent him. As the Shepherds fixed their eyes on the Crib, so let ours be on the Altar, where we are soon to behold the same Jesus, hidden under appearance that are humbler even than the swathing bands. These rustic swains enter into the Cave, not yet knowing Him whom they are going to see; but their hearts are quite ready for the revelation. Suddenly, they see the Infant; and as they gaze upon him in speechless wondering, Jesus looks at them from his Crib and smiles upon them: they are changed men, full of light, and the Sun of Justice has made Day in their souls. It is to be the same with us: the words of the Prince of the Apostles are to be verified in us: the Light that shineth in a dark place has been our one desire and attention—now the Day will dawn, and the Day-Star arise in our hearts. This long longed-for Aurora has come! The divine Orient has risen upon us, to set now no more; for we are firmly resolved to keep from the night of sin, which his grace has destroyed. His mercy has made us to be children of light and children of the day. There must be no more sleep of death for us. We must watch in ceaseless vigilance, remembering how the Shepherds were keeping their watch when the Angel came to speak to them and Heaven opened over their heads. All the Chants of this Mass of the Aurora speak to us of the brightness of the Sun of Justice; they must be sweet to us, as is to captives, long buried in the cold darkness of their dungeon, the ray of that morning, which is to set them free. See, Christians, how this God of Light shines upon us from his Crib! The face of his Mother is lit up with the immense brightness, on which she looks with all the fixedness of her contemplating love; and Joseph, too, has the shining vivid on his features, which makes them more beautiful and venerable than we have ever seen them. Passing by the ungrateful Bethlehem, which deserves to be left in darkness—this same divine Light breaks upon the whole world beyond the Cave, and gradually enkindles within millions of hearts a burning love for this glorious Sun of Justice, who delivers man from the labyrinth of his errors and passions, showing him and giving him the sublime end for which he was created. In the very midst of her celebration of this mystery of the Birth of Jesus, the Church offers us another object of admiration and joy: it is one of her own children. While solemnizing the divine Mystery of today’s Feast, she commemorates, in this the second Mass, one of those glorious heroines who preserved the Light of Christ within their souls, in spite of all the attacks made to rob them of it. Her name is Anastasia. This holy Widow of Rome suffered martyrdom under the persecution of Dioclesian, and had the privilege of being thus born to eternal life, on the Birth-Day of that Jesus for whom she suffered death. She had been married to a Pagan of the name of Publius, himself also a Roman; who, being irritated against her on account of her great charities to the Christians, treated her with every sort of cruelty. She endured all with admirable patience; and when this heavy trial was removed from her by the death of her husband, she devoted herself to visiting and solacing the holy Confessors, who had been cast into the prisons of Rome for the Faith. Being at length apprehended as a Christian, she was tied to a stake and burnt to death. Her Church in Rome, which is built on the site where formerly stood her house, is the Station for this Second Mass. The Sovereign Pontiffs used formerly to say it here, and the ancient custom was observed in our own times by Pope Leo 12th. “Exult, O ye Virgins of Christ! for the Mother of Christ is your companion. You could not be his Mother; but, for his sake, you would be Virgins: He that is not born of you, is born to you. And yet, you remember his words: Whosoever shall do the will of my Father, is my brother, and sister, and mother. Now, have you not done the will of his Father? But the Holy Sacrifice is about to commence. The Introit tells us of the Birth of Jesus our Sun of Justice. The brightness of his first rising is the presage of his midday splendor. Strength and Beauty are his. He is armed for victory, and his name is Prince of Peace. Lux fulgebit hodie super nos; quia natus est nobis Dominus: et vocabitur Admirabilis, Deus, Princeps pacis, Pater futuri sæculi; cujus regni non erit finis. A light shall shine upon us, this day; because the Lord is born for us: and his name shall be the Wonderful One. God, the Prince of Peace, the Father of the world to come; of whose reign there shall be no end. Ps. Dominus regnavit, decorem indutus est: indutus est Dominus fortitudinem, et præcinxit se. ℣. Gloria Patri. Lux fulgebit. Ps. The Lord hath reigned, he is clothed with beauty: the Lord is clothed with strength, and hath girded himself. ℣. Glory, &c. A light. The prayer of the Church, in this the Mass of the Aurora, is the begging of God to pour upon our souls the rays of the Sun of Justice, that so we may become fruitful in works of Light, and be no more the slaves of darkness. Da nobis, quæsumus, omnipotens Deus, ut qui nova incarnati Verbi tui luce perfundimur, hoc in nostro resplendeat opere, quod per fidem fulget in mente. Per eumdem. Grant, we beseech thee, O Almighty God, that as we are enlightened by the new light of thy Word become flesh, we may show, in our actions, the effects of that faith, which shineth in our minds. Through the same, &c.
Da, quæsumus, omnipotens Deus, ut qui beatæ Anastasiæ, Martyris tuæ, solemnia colimus, ejus apud te patrocinia sentiamus. Per Dominum. Grant, we beseech thee, O Almighty God, that as we celebrate the solemnity of blessed Anastasia, thy Martyr, we may be sensible of the effects of her prayers to thee in our behalf. Through, &c.
Charissime:apparuit benignitas et humanitas Salvatoris nostri Dei: non ex operibus justitiae, quae fecimus nos, sed secundum suam misericordiam salvos nos fecit per lavacrum regenerationis et renovationis Spiritus Sancti, quem effudit in nos abunde per Jesum Christum Salvatorem nostrum: ut justificati gratia ipsius, æeredes simus secundum spem vitae æternæ. Most dearly beloved: The goodness and kindness of God our Saviour appeared: Not by the works of justice, which we have done, but according to his mercy, he saved us, by the laver of regeneration, and renovation of the Holy Ghost; Whom he hath poured forth upon us abundantly, through Jesus Christ our Saviour: That, being justified by his grace, we may be heirs, according to hope of life everlasting. This Sun which has appeared on our earth is God our Savior, full of tenderest mercy. We were far off from God, and were sitting in the shades of death—the rays of the divine Light had to reach down to us in the deep abyss of our sins; and now, praise be to this Infinite Mercy! we are set free, and with our freedom have received regeneration, justification, and heirship to eternal life, as the Epistle reminds us. Who shall henceforth separate us from the love of this Infant Jesus? Is it possible that we ourselves can ever frustrate the designs of that love by rendering all that it has done for us useless, and becoming once more the slaves of darkness and death? May God forbid it! and grant us grace to maintain our hope of everlasting life, which the Mystery of our Redemption has purchased for us. Benedictus qui venit in nomine Domini: Deus Dominus, et illuxit nobis. Blessed be he that cometh in the name of the Lord: the Lord is our God, and he hath shone upon us. ℣. A Domino factum est istud, et est mirabile in oculis nostris. ℣. This is the Lord’s doing, and it is wonderful in our eyes. ℣. The Lord hath reigned, he is clothed with beauty: the Lord is clothed with strength, and hath girded himself with might. Alleluia. In illo tempore: Pastores loquebantur ad invicem: Transeamus usque Bethlehem, et videamus hoc verbum, quod factum est, quod Dominus ostendit nobis. Et venerunt festinantes: et invenerunt Mariam, et Joseph, et infantem positum in praesepio. Videntes autem cognoverunt de verbo, quod dictum erat illis de puero hoc. Et omnes qui audierunt, mirati sunt: et de his quae dicta erant a pastoribus ad ipsos. Maria autem conservabat omnia verba haec, conferens in corde suo. Et reversi sunt pastores glorificantes et laudantes Deum in omnibus quae audierant et viderant, sicut dictum est ad illos. At that time: The shepherds said one to another: Let us go over to Bethlehem, and let us see this word that is come to pass, which the Lord hath shewed to us. And they came with haste; and they found Mary and Joseph, and the infant lying in the manger. And seeing, they understood of the word that had been spoken to them concerning this child. And all that heard, wondered; and at those things that were told them by the shepherds. But Mary kept all these words, pondering them in her heart. And the shepherds returned, glorifying and praising God, for all the things they had heard and seen, as it was told unto them. Let us imitate the earnestness of the Shepherds of the Gospel in their hastening to Jesus. No sooner do they hear the Angel’s words than they start for the holy Stable in Bethlehem. Once in the presence of the Divine Infant, they know him by the sign that had been given them by the Angel; and Jesus is born in their souls by his grace. These happy men delight now in their poverty, for they find that He too is poor. They feel that they are united to him forever, and their whole lives shall testify to the change that this December Night has worked in them. They do not keep a great event to themselves; they tell everyone about the Babe of Bethlehem, they become his Apostles, and their burning words fill their listeners with astonishment. Like them, let us glorify the great God who, not satisfied with calling us to the admirable Light, has set it in the very center of our hearts, by uniting us to himself. Let us often think of the Mysteries of this glorious Night, after the example of Mary, who keeps unceasingly in her most pure Heart the wonderful things that God has been accomplishing by her and in her. During the Offertory of the sacred gifts, the Church extols the power of our Emmanuel, who, that he might reform this fallen world, humbled himself so far as to have a few poor Shepherds for his courtiers, He whose Throne and Divinity are from eternity. Deus firmavit orbem terræ, qui non commovebitur: parata sedes tua, Deus, ex tunc; a sæculo tu es. Munera nostra, quæsumus, Domine, Nativitatis hodiernæ mysteriis apta proveniant, et pacem nobis semper infudant: ut, sicut homo genitus idem refulsit et Deus; sic nobis hæc terrena substantia conferat quod divinum est. Per eumdem. May the offerings, O Lord, we make, be agreeable to the mystery of this day’s Birth, and always pour forth peace upon us: that as He, who, though born Man, showed himself also God, so may this earthly substance give us that which is divine. Through the same, &c.
Accipe, quæsumus, Domine, munera dignanter oblata: et beatæ Anastasiæ, martyris tuæ, suffragantibus meritis, ad nostræ salutis auxilium provenire concede. Per Dominum. Graciously receive, O Lord, we beseech thee, our offerings, and grant, by the merits of blessed Anastasia, thy Martyr, that they may avail to our salvation. Through, &c.
After both Priest and people have communicated, the holy Church, all illumined with the sweet Light of her Spouse, to whom she has just been united, applies to herself the words which the Prophet Zachary formerly addressed to her, when he announced the coming of the King, her Savior. Exsulta, filia Sion; lauda, filia Jerusalem: ecce Rex tuus venit Sanctus, et Salvator mundi. Rejoice, O daughter of Sion; shout for joy, O daughter of Jerusalem: behold! thy King will come to thee, the Holy One, and the Savior of the world. Hujus nos, Domine, sacramenti semper novitas natalis instauret: cujus nativitas singularis humanam repulit vetustatem. Per eumdem Dominum. May we, O Lord, always receive new Light from this Sacrament, which reneweth to us the memory of that wonderful Birth, which destroyed the old man. Through the same, &c.
Satiasti, Domine, familiam tuam muneribus sacris: ejus, quæsumus, interventione nos refove, cujus solemnia celebramus. Per Dominum. Thou hast fed, O Lord, thy family with these sacred oblations; ever, therefore, comfort us with her intercession, whose feast we celebrate. Through, &c.
The Mass of the Aurora ended, and the Birth of Grace having been honored by this second immolation of the divine Immortal Victim—the Faithful retire from the Church, that they refresh themselves by sleep, and so be in readiness for the Third Mass. Mary and Joseph are in the Stable of Bethlehem, watching near the Crib. The light which reflects from the new-born Babe, and which surpasses the brightness of the sun that is just rising, fills the Cave and shines on the rocks outside; but now that the Shepherds are gone, and the Angels are singing elsewhere, there is silence in the sacred grotto. As we lie down to take our rest, let us think upon the Divine Infant, and how he passes this his first night, in his humble Crib. That he may conform to the necessities of our human nature, which he has assumed, he closes his tender eyelids, and sleep comes, because he so wills it, and lulls his senses to rest—but even while asleep, his heart watcheth, offering itself unceasingly for us. At times, he smiles on his Mother, who keeps her eyes fixed on him, loving him as She alone can love; he prays to his Eternal Father, and implores pardon for guilty man; he expiates for our pride by his own humiliations; he shows himself to us as the model of the infancy we must now begin to practice. Let us ask him to give us of the merit which attaches to this his sleep; that so, after having slept in peace, we may wake in his grace, and walk on strenuously in the path we have now entered.